This entry was posted in church history, Community of Christ, LDS, Mormonism, Temples. Were any ordinances performed at Kirtland? I was under the understanding that some form of washing of the feet was practiced there. Also, I really like the infographics. Are the temples to scale? The temples are to approximate scale, yes. Feet-washing and also anointing with oil were done in Kirtland, but not as a regularized ordinances. Feet washing is based on the story in the gospel of John and anointing on the old testament practices. These were precursors and precedents for later Nauvoo developments. But there wasn’t a space set aside for feet-washing, which may have actually taken place in an adjacent building. Thank you for this! It’s fascinating, enlightening, and the visuals are very helpful in understanding. I’m so pleased — I’m glad if they’ve proved helpful in all those ways. Thanks! Buerger detailes in chapter 2 of his book The Mysteries of Godliness the extensive ceremony of the endowment which was had at the Kirtland Temple. B.Y. said it was essentially a preview of what was to come later. But still, very much an endowment ceremony. The chapter is very well documented, showing the washing, anointing, and blessing of the Kirtland ceremony. Was it Ehat who compared the portions of the Kirtland and Nauvoo endowment, showing that most of the Nauvoo endowment was reflected in the Kirtland setting, only the Nauvoo iteration _set the words_ for the anointing, etc. IOW, in Kirtland they were going by inspiration. The Spirit of God is a such a wonderful hymn, filled with rich imagery. The last verse “How blessed the day when the lamb and the lion shall lie down together without any ire” anticipates Community of Christ’s historic peace seal which is put in relief on the large metal doors in the Temple in Independence. You’re absolutely right that there were washings and anointings and feet-washing in the Kirtland era outside and in some cases inside the temple. However, I personally think we tend to view the washing and anointing that took place in Kirtland too much through the lens of hindsight because of their later importance in Nauvoo-era practices and their modern association as “temple work”. In the chart as drawn, the specific idea is to identify spaces set aside for regular use in the different eras. “Endowment” in Kirtland was not ritual; it was meant to be a strengthening outpouring of the Spirit as a blessing for completing the command to build a House of the Lord. Lots of things were done in Kirtland, some in the temple and some out, like joint-visions (closing eyes and seeing with spiritual eyes), speaking in tongues, taking communion/sacrament. I think the way to look at washing and anointing in the Kirtland period is to see these as precedents for later practice, rather than to retroject their later importance into the Kirtland period and see them as more important than they were at the time. That said, I do agree that the later washing and anointing practices in Nauvoo had the Kirtland-era events as a precedent, just as the word “endowment” was a precedent, albeit one that was repurposed in Nauvoo. nice article and great graphics. i am curious as to why the baptism for the dead ritual practiced in Nauvoo is left out of current Community of Christ practice? Am I correct to assume the Independence temple is open to the public and that public worship is held there? Thanks, Wes. The temple in Independence is open to the public and public worship is held there. In the Community of Christ tradition, baptism for the dead is something that members in Nauvoo did to connect themselves to their deceased loved ones and other predecessors. It could therefore be useful as a spiritual formation ritual for the living; but it is not an essential or necessary saving ordinance for the dead. Thanks John for this post. 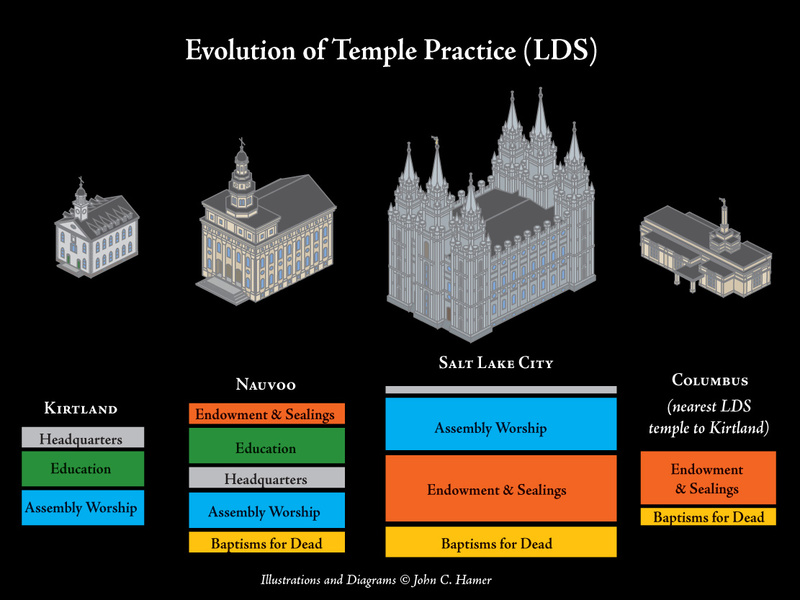 How each church developed the Temple has always been of interest to me. it seems to me that the CofC has kept to the basic purpose of the original Temple in Kirtland with the Independence Temple of today. 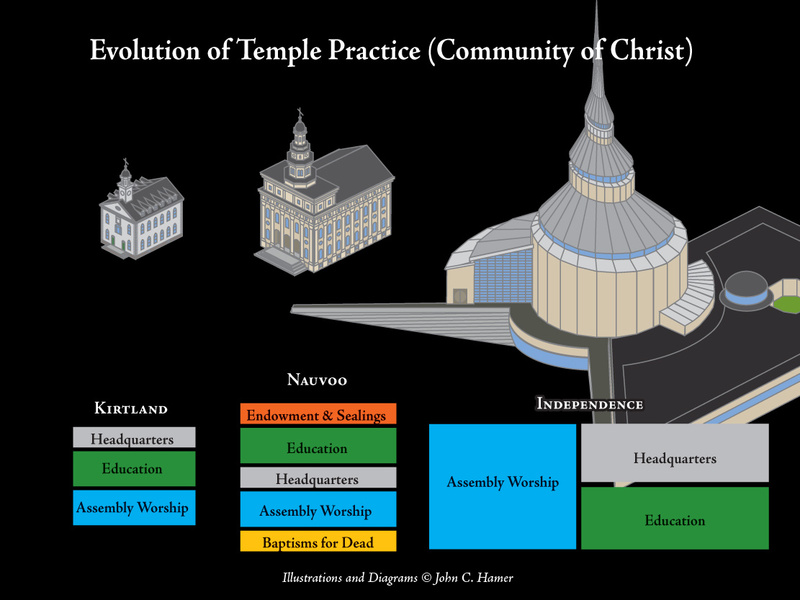 Are the practices of LDS Temples mostly derived from the Nauvoo and post Nauvoo periods when other people were in charge after Joseph Smith’s death?